Last week I had the opportunity to lead a team of 11 volunteers from my office in our annual day of service. We visited a nursing home located across the street from where we work. 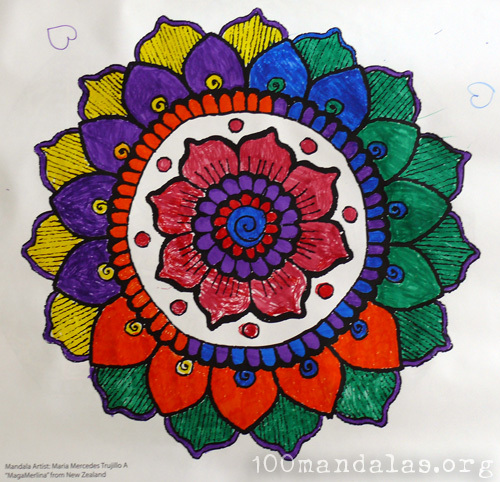 Our icebreaker activity was coloring mandalas. 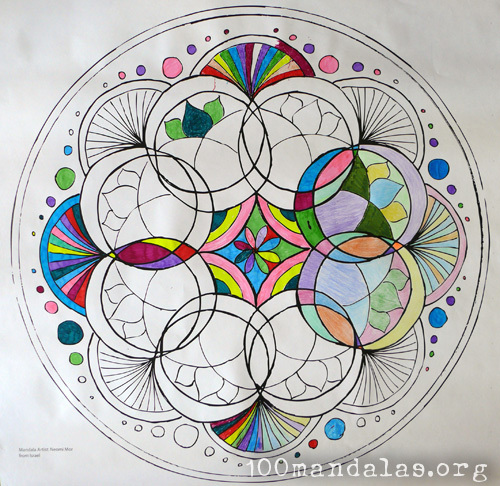 I’ve been collecting mandalas for a coloring book and selected six to enlarge for this activity. 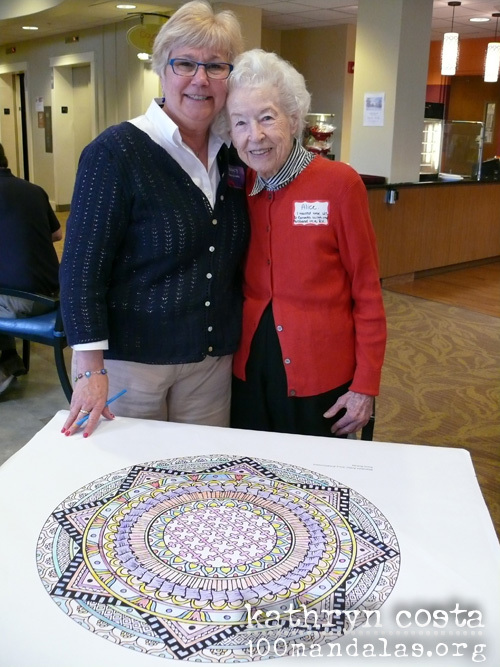 Two volunteers and two residents sat around a mandala sized 33 inches. The project was a huge hit! As you can see from Rita’s name tag that she loves dogs. It looks like she enjoys coloring too. The fun facts on the name tags gave us some great conversation starters. Look Irene is wearing a mandala shirt! 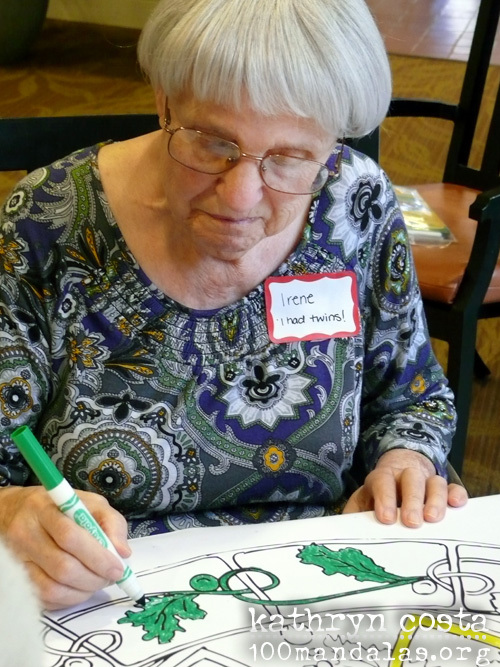 I think Irene loved coloring the most. She barely said a word and wanted to color all day long. It warmed my heart to see her so engaged in the project. Julie is a sweet woman. 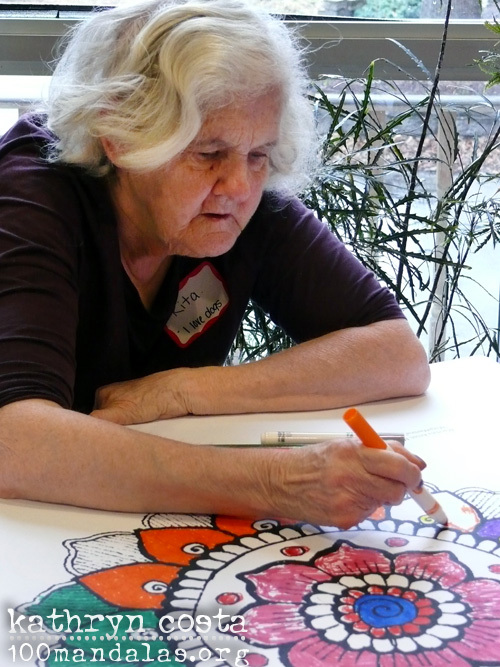 You’ll see her in next week’s post showing off our afternoon art project that ties in with the next Mandala Workbook Stage Five. Look for it! I had the opportunity to get to know Margaret over lunch. Each resident had stories to tell and the volunteers were all ears. Beautiful friendships were formed too. Many of the volunteers plan on returning on their own time. It made a difference to these people to have us visit, listen, and show that we care. 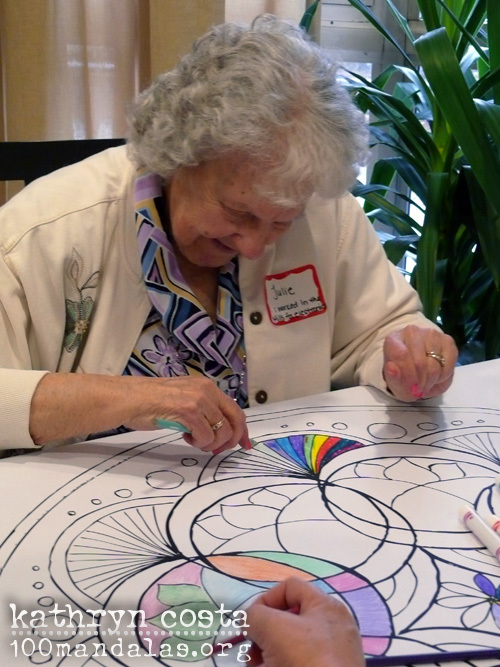 After the mandala coloring project some prayed the Rosary in the chapel, we had a word competition, cribbage, walks, and another art activity. Oh and let’s not forget that many of the women loved having their nails polished. 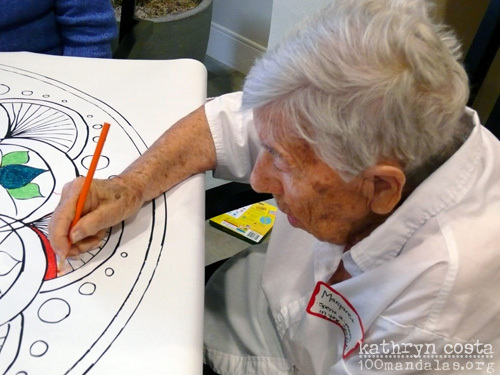 I will be returning this summer to organize a mandala event for residents and their families. I can’t wait to return. 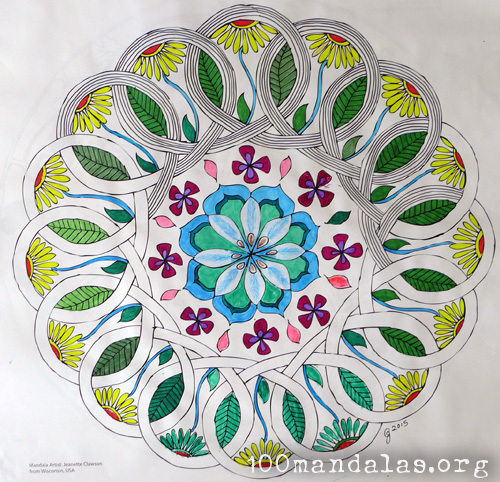 For this week’s theme, I want to encourage you to share your love for mandalas. 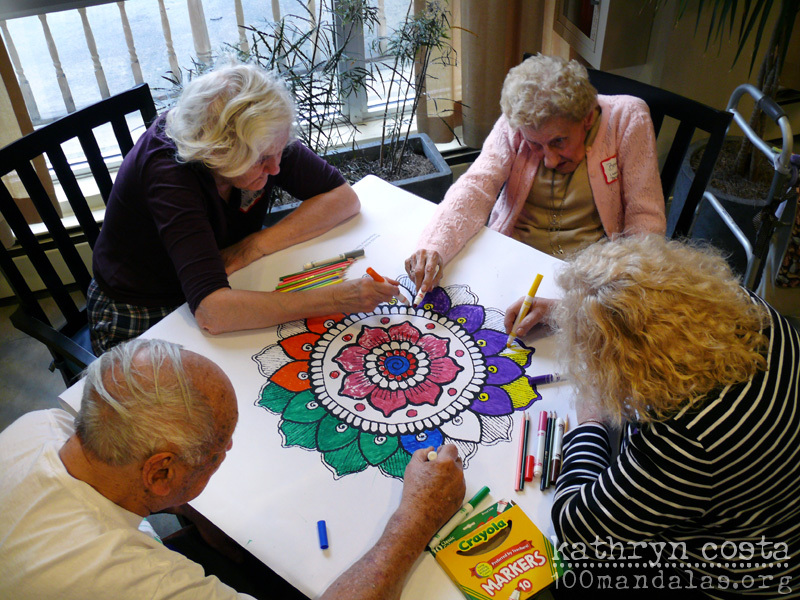 Maybe there is a senior in your life who would enjoy coloring mandalas with you? How about visiting the local nursing home? 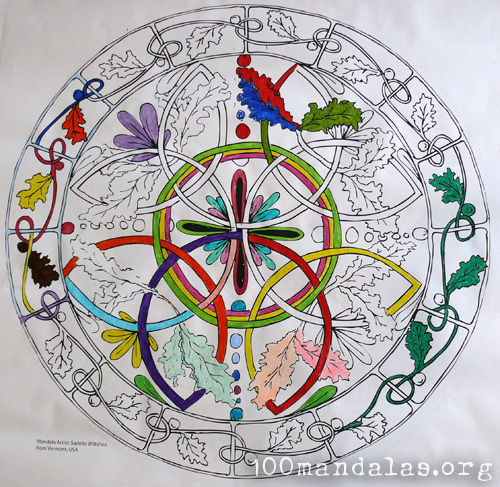 Many thanks to the mandala artists who submitted their mandalas for the coloring book. 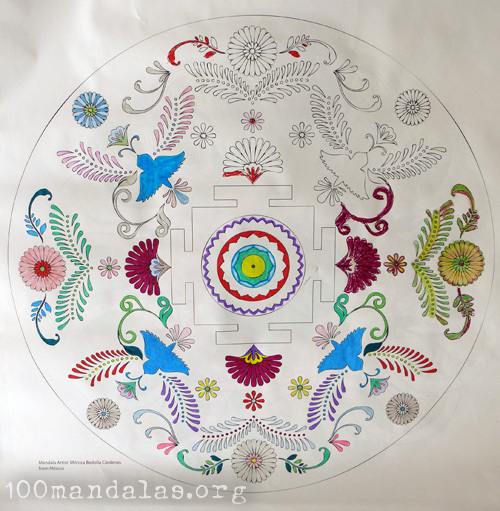 Pictured above is a mandala designed by Irina Artamonova from Russia. Do you love to color? 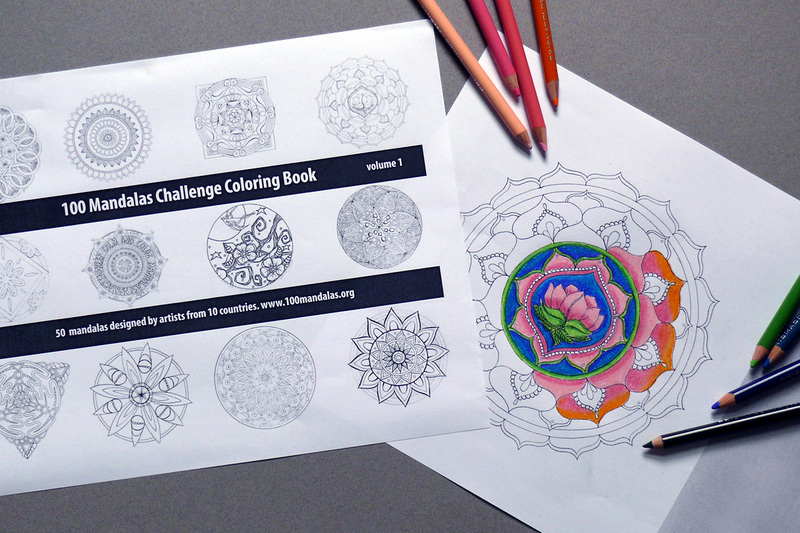 We have a couple of FREE coloring books that you can download. 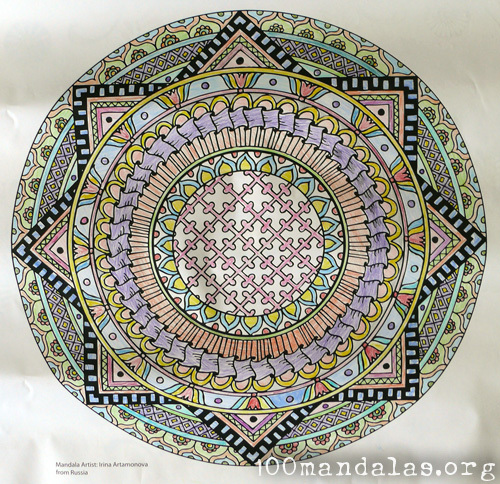 Volume 1 pictured above has 50 mandalas. The ones you enlarged to 33″, was that on paper or a cloth? It doesn’t look like paper in the picture. I’m interested in doing this locally. Thanks so much. They were done on paper.